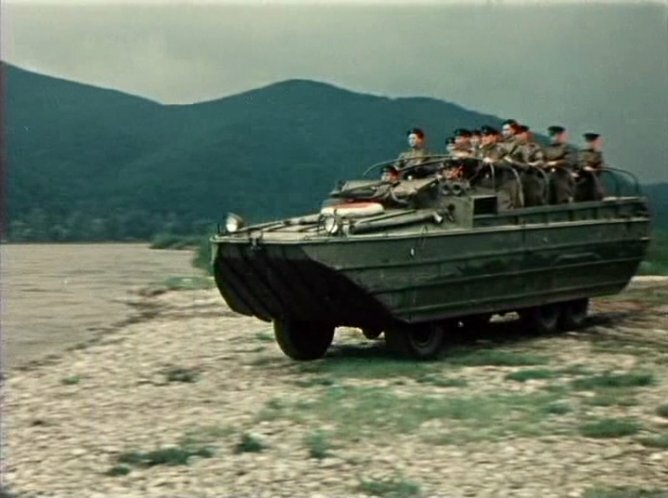 Derived directly from the wartime 6 x 6 DUKW provided under Lend-Lease, the BAV-485 is a watertight boat-like body on a Soviet truck chassis. 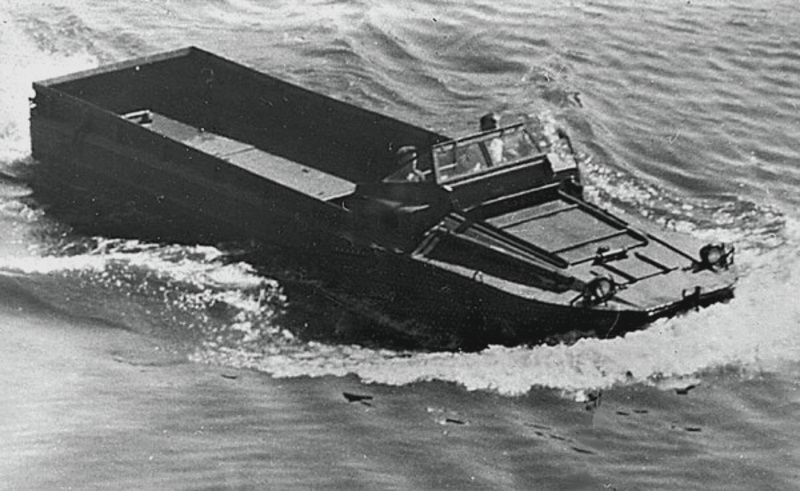 Following the successful use of American-supplied DUKW 6×6 amphibious vehicles by the Soviet army during World War II, it was decided to build a similar vehicle but based on a Soviet truck chassis. This finally appeared in the early 195Os as the BAV-485, sometimes called the ZIL-485, The layout of the BAV-485 is similar to that of. 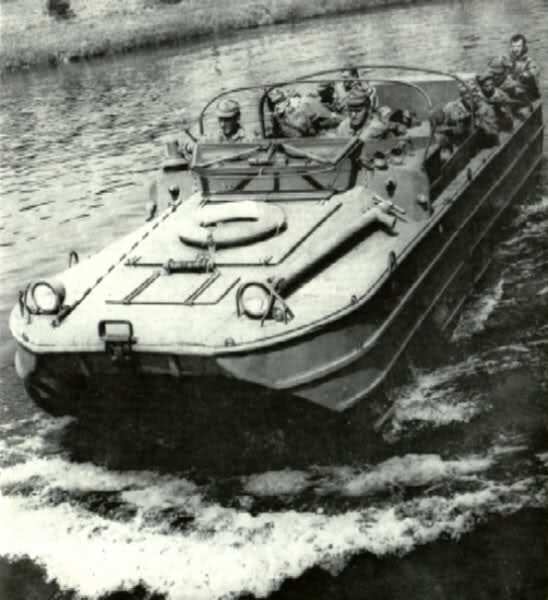 the American DUKW with the engine and transmission at the front, crew seats to the rear of the engine compartment, and the cargo area at the rear. A maximum of 2500 kg (5,511-lb) of cargo or 25 fully equipped troops can be carried. The crew at the front are provided with a windscreen which can be folded forwards, and if required bows and a tarpaulin cover can be erected over the crew and troop compartments. A major improvement over the original American DUKW is the installation of a drop-down tailgate at the very rear of the cargo compartment, which enables light vehicles, mortars and light artillery weapons to be loaded very quickly. The engine is coupled to a manual gearbox with five forward and one reverse gear, and a two-speed transfer case,- The main brakes are pneumatic, with a mechanical parking brake that operates on the rear wheels only. The BAV-485 is powered in the water by a single three-blade propeller mounted under the rear of the hull, and before the vehicle enters the water bilge pumps must be switched on. The basic BAV-485 was based on the ZIL-151 6×6 2500-ks (5,511-1b) truck chassis built by the Likhachev Motor Vehicle Plant ln Moscow between 1947 and 1958. Later production vehicles were based on the ZIL-157 6×6 2500-kg (5,511-1b) truck chassis built at the same plant between l95B and 1961, this model being designated the BAV-485A. The major difference between the BAV-485 and the later BAV-485A is that the former has external air lines for the central tyre pressure-regulation system while the latter has internal air lines which are less easily damaged. The central tyre pressure-regulation system is a common feature on Soviet wheeled armoured vehicles and military trucks, and enables the driver to adjust the ground pressure to suit the ground being crossed. It is by no means a new idea, however, as the Americans had a similar system on their DUKWs during World War II. Some BAV-4BSs have been observed with a 12.7-mm (0.5-in) DShKM heavy machine-gun for anti-aircraft defence, this being mounted on the forward right side of the troop compartment.